This painting is a late masterwork by Isoda Koryusai, who was an important and prolific ukiyo-e painter and printmaker in the last quarter of the eighteenth century, a time when Koryusai and other artists showed a keen fascination with the natural world. 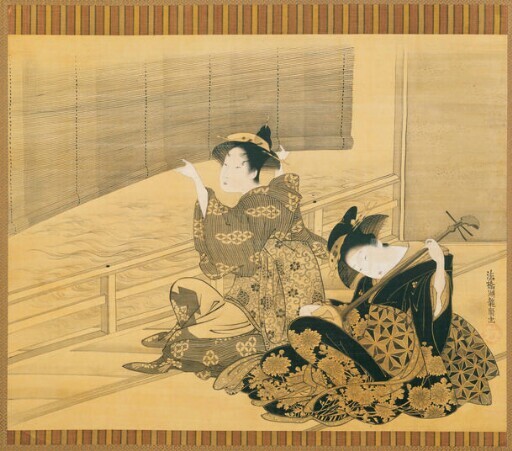 In the Kimbell’s painting, the intimate scene of a courtesan and her attendant in a teahouse overlooking a river subtly suggests the elegance and entertainment of the pleasure quarters. The bamboo shade that is being rolled up by the young attendant indicates that the weather is warm, while the chrysanthemums decorating the kimono of the courtesan signal the end of summer and the approach of autumn. The wind gently blows ripples across the water. Reflecting the most current modes, the two women wear a popular hairstyle of the period, in which the side locks billowed out, taking on the abstract form of a lantern top or open fan. The richly patterned textiles and the strong diagonal formed by the railing of the verandah make this monochromatic painting a work of unusual sophistication and visual appeal. purchased by Kimbell Art Foundation, Fort Worth, 1984.